Ever wanted to say prayers but did not know what to say or just a little rusty, or wanted to teach someone and did not know them properly, here's some of the common prayers that you can say or teach. If you feel Blessed by this page, pass it on to another or link it to your own page so someone else can get by. Prayers for guidance in life, study, inspiration will be added gradually. These prayers are just guidelines, and one can pray from one's heart to God. I believe in God, the Father Almighty, Creator of heaven and earth; and in Jesus Christ, His only Son, Our Lord; who was conceived by the Holy Spirit, born of the Virgin Mary, suffered under Pontius Pilate, was crucified, died and was buried. He descended into hell; the third day He arose again from the dead; He ascended into heaven, and is seated at the right hand of God, the Father Almighty; from thence He shall come to judge the living and the dead. I believe in the Holy Spirit, the Holy Catholic Church, the communion of saints, the forgiveness of sins, the resurrection of the body, and life everlasting. Amen. Merciful God, anoint me with Your Holy Spirit. As I read Your Word, let me hear Your voice speaking to me from within. Give me wisdom to understand Your message to me. Let Your Word be the joy to my heart and the light to my feet. Ge me strength to build my life on Your Word. Let it be done to me according to Your Word. May I rejoice in the blessedness of hearing Your Word and keeping it. Speak Lord; Your servant is listening. Thank You Jesus ... Praise You Jesus. During Lent, the Sorrowful Mysteries are said on Saturday and Sunday. Pray for us, 0 Holy Mother of God: that we may be made worthy of the promises of Christ. Let us pray: Pour forth we beseech you, 0 Lord, your grace into our hearts, that we to whom the incarnation of Christ, your Son, was made known by the message of an angel, may, by his passion and cross, be brought to the glory of his resurrection. Through the same Christ our Lord. - Amen. 0 Queen of heaven, rejoice, Alleluia. For He whom you merited to bear, Alleluia. Has risen as he said, Alleluia. Pray for us to God. Alleluia. Rejoice and be glad, 0 Virgin Mary, Alleluia. For the Lord has risen, indeed. Alleluia. Let us pray: 0 God, who did’st vouchsafe to give joy to the world through the resurrection of your Son, our Lord Jesus Christ, grant, we beseech you, that through His Mother, the Virgin Mary, we may obtain the joys of everlasting life. Through the same Christ our Lord. Amen. Lord our God, you feed the birds of heaven and clothe the lilies of the field. We praise and thank you for all your creatures and for the food we, are about to receive: we pray that no one may be left without nourishment and bare. Through Christ Our Lord. Amen. Bless us, 0 Lord, and these your gifts, which we are ab receive from your bounty, through Christ our Lord. Amen. Bless us, 0 Lord, and these your gifts, which we are about to receive from your bounty: We make our prayer through Christ our Lord. Amen. Lord God, we thank you for the nourishment you have given us. May what we have shared deepen and renew our communion. with you, with our brothers and sisters, and with all your creatures. Through Christ our Lord. Amen. We give you thanks for all your benefits, 0 almighty God, lives and reigns forever; and may the souls of the faithful parted, through the mercy of God, rest in peace. Amen. Come, Holy Spirit, fill the ;hearts of your faithful and kindle in them this fire of your love. Send forth your Spirit, 0 God, and we shall be created; and you will renew the face of the earth. Let us pray: 0 God, you instructed the hearts of your faithful by the light of the Holy Spirit. Give us this same Spirit; under his divine inspiration, may we have a sense of what is true and a taste for what is good and so always experience the fruit of his consolation. This we ask through Jesus Christ, your Son. Amen. Remember, 0 most gracious virgin Mary, that never was it known that anyone who fled to your protection, implored your help or sought your intercession was left unaided. Inspired with this confidence I fly unto you 0 Virgin of Virgins, my Mother, to you do I come, before you do I stand sinful and sorrowful, 0 mother of the Word Incarnate despise not my petitions but in your mercy hear and answer me. Amen. Lord, make us instruments of your peace. Where there is hatred, let us sow love, Where there is injury, pardon; Where there is discord, union; Where there is doubt, faith; Where there is despair, hope; Where there is darkness, light; Where there is sadness, joy; for your mercy and for your truth's sake. 0 God, my Father, at the dawn of this new day, I reverently adore you. With a joyful heart I acknowledge that you are my Creator, that you are my Lord and Master. It is from you I have received all I am and all I have, it is for You that my whole being craves. You, 0 God, are my Father, and you have made me your very own. With all the angels and saints, with all my brothers and sisters throughout the world, full of joy and gratitude I adore you and worship you 0 my God. 0 God, I have never seen you. No human eye has seen You, and no one can fathom the abyss from which all beings rise and to which all life returns. But you have shown me your face in Jesus Christ. I have found him and I believe in him. Whoever has seen him, sees you. So I believe with a joyful heart that you are my father, and that my life through Jesus is sheltered in your love. It can never be lost as long as I allow myself to be carried by your love and guided by your spirit. Often my faith is tired and timid, but you are greater than my heart. 0 God, I believe in you. Our world has lost hope. Many of us are in distress and their life runs into an endless desert without hope. There are others, they are secure and sheltered, have food and housing, money and power and pleasure. They have what they need, and they have no hope either except for the next day. But my heart, 0 God, is empty. Whatever, you have taken from me in my life has widened the emptiness, and whatever you gave me made me even more hungry for you, because this is your promise, nothing less, that I shall see you face to face, my God. You can never go back on your word because you have sealed it with the glory of your Risen Son. I trust that you will lead me ail the way to your glory, because you have already given me your Holy Spirit dwelling in me ' the pledge of your never ending love and life. 0 God, I hope in you. Is it true, 0 God, that you are love ? Strife stares at me from every corner of this world, people estranged from each other, from themselves, drifting into ever deeper isolation. But I have seen Jesus, your Son. He was cast out from us, and wounded beyond human endurance, and still he loved to the very end. And he inspired others to love, forgive and bless even their enemies. He has awakened also in my own heart the longing to love' truly and deeply, in thoughts and deeds. Through him there is a new power of love in our world that transforms hearts and begins to create a new world. It comes only from you. So I believe in, your love, and I believe that one day the power for your love will be victorious in my own heart and in the whole world. It will burn out all the twisted and poisonous jungles of hate. I wish to belong to this new world, where you are with your people as our God and our light. 0 God, I love you. 0 God, I thank and praise you for giving me my life, to fill it with your love and to guide me to my final goal. You want me to make your gift my own and to respond to your call. I know that my response has been poor, that I have not lived up to your love and guidance. This pains me. But I know that your love for me has not decreased. You continue to invite me and so I place my life anew into your hands. Heal my heart, renew my courage, lead me on. 0 Jesus, through the Immaculate Heart of Mary I offer you my prayers, works, joys and sufferings of today, for all the intentions of Your Divine Heart, in union with the Holy Sacrifice of the Mass throughout the world, in reparation for my sins, for the intentions of the Holy Father for this month. 0 God, grant that I may live this day in your love. Keep me happy through all the events of today, knowing that i I am loved by You, and that You are guiding my life. Let me be appreciative of all the love I receive from others and of all that good that is done to me by so many every day. Help me make my life a blessing for others. Make me sensitive to their feelings, their needs and joys and sorrows, and help me to bring joy to all Who come into my life. Bless all those who feel the need of your help, those who are suffering, those in worry, anxiety, sickness or pain. In my heart let me carry a good wish and a blessing for. all around me. One can say the Our Father in heaven. My Queen and my Mother, Mary, Jesus gave you to me as my mother, and gave me to you as your child. I joyfully turn to you, Mother, and consecrate to You my eyes, my ears, my mouth, my heart and my whole person. Intercede for me that I may be filled with the Holy Spirit and draw ever closer to Jesus. After your example may I ponder deeply in my heart all that the Lord does and says to me today; and teach me Mother, to love others, as he loved Amen. Lord Jesus, you love all men, and on the day before you died, you expressed your earnest desire that we always remember the love with which you gave yourself for us, and live in that love. Lord I recall with gratitude and joy how you gave yourself to us at the Last Supper in the gifts of bread and wine, your body and blood, that we may share in your death and resurrection and be filled with your Spirit. Come to me today Lord Jesus. I acknowledge you as my personal Saviour and Lord. Live in me continually through your Spirit that, dead to sin and alive in the Spirit, my life may be lived in love. (Whenever we would like to attend Mass, but cannot, we can still offer the Mass in our hearts: i.e. we can remember Jesus in His last supper and join him in the offering he makes to the Father, and receive spiritually the gift he gives of himself to us. 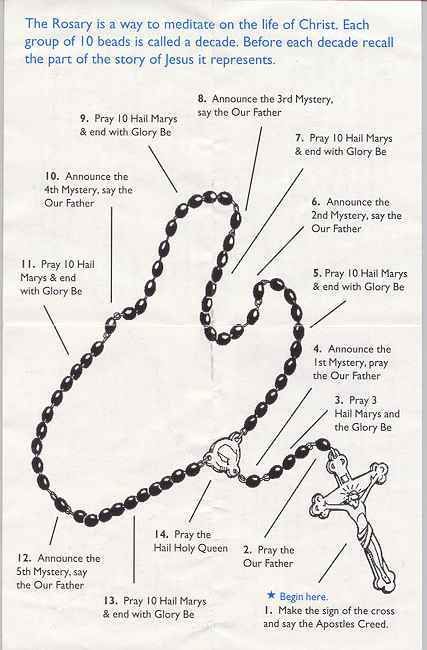 The following prayer will be a help). O God our Father, on the day before he died, Jesus called together his disciples to share a final meal with them. He always loved those who were his own in the world and now he would give them the uttermost proof of love (Jn: 13.1). As he began the Supper he said to them, 'I have longed and longed to eat this meal with you before I suffer.' (Lk: 22.) At the end of that meal Jesus told them, "Do this in memory of me". Jesus desires to be remembered ; he desires that the Supper he shared on the last evening of his life the moment of the greatest sign of his love be always recalled and re-enacted in his memory. Thank you, heavenly Father, for coming to us in Jesus. You have always loved man whom you created in your own image and likeness; you did not abandon him when he rejected you through disobedience, but through your prophets repeatedly offered him a covenant of friendship. And in the fullness of time, in your great love for us, Father you sent us your Son Jesus to make with us an everlasting covenant by saving us from sin and giving us your Spirit. Jesus proclaimed the good news of your love to the poor, freedom to prisoners, joy to those in sorrow. Men rejected him and crucified him, but he did not cease loving us; he loved us to the end, and on the cross showed us your undefeatable love. He died by our sinfulness, but he rose again to love us still; and thus destroyed death and restored life. On the cross he also gave himself to you on our behalf, offering you the total love of the human heart. Even though he felt rejected and abandoned, he remained faithful to the very end, and commanded his spirit into your hands. He offered you his faithful love on behalf of all men, making atonement for our sin in his blood. Father, Jesus wished that in every age people would join him in the fullness of self -offering he made to you and that through him they would receive your love. So on the night before he suffered, when Israel celebrated the memorial of how you liberated them from Egypt into the freedom of being your people through the covenant, he instituted a new memorial , the memorial of our liberation from sin into the freedom of being your children in the Spirit. Responding to his loving invitation we reverently receive in spirit his body that was broken for us and his blood that he poured out for us that we may be one with him in the great sacrifice he offers you for us. And so, recalling his passion, death and resurrection we offer ourselves to you Father along with Jesus we offer you also all those who are part of our lives, those near and dear to us and those with whom we come in daily contact, along with … our Pope, and …. Our Bishop and all who work for the spread of your kingdom. We offer you our brothers and sisters, the saints, with Mary our Mother; and we remember in this offering all the dead whose faith is known to you alone. And so in this great offering of Jesus, may the whole creation and all times and all ages and all peoples and all nations ring out your praise 0 Father, for through Him and with him and in him, in the unity of the Holy Spirit, all glory and honour is yours, almighty Father, forever and ever Amen. And with Jesus we pray, our Father in heaven, holy be your name, your kingdom come, your will be done on earth as in heaven ; give us today our daily bread, forgive us our sins, as we forgive those who sin against us, do not bring us to the test but deliver us from evil ; for the kingdom the power and the glory are yours now and forever. Amen. Father, as we have received Jesus and with him offered ourselves to you, renew again your covenant with us; make us your own children and fill us with your Spirit and your gift of peace. Send us forth now to live our love for you in the service of others. May your blessing descend upon us, upon your Church and upon the whole world, forever and ever Amen. You loved children. You said: "Let the children come to me." Bless the children of the world. We pray, especially, for those who are poor, deprived, in bonded labour, and those who have no means to educate themselves. May your Spirit comfort them, and guide them. And may the same Spirit lead those who are fortunate, to reach out to these poor children through encouragement, support, and financial help. Thus may your love continue to shine on the children of the world, through the generosity of those who reach out to them. This we ask of you through the Holy Spirit, Amen. (On how to help children, write for free brochure to: Attn: Fr. E. Cleary, cssr., Renewal Educational Services, C/o. No.4, Wheeler Road, 1st. Cross, Frazer Town, Bangalore 560005, India ). We believe in one God, the Father, the Almighty, maker of heaven and earth, of all that is seen and unseen. We believe in one Lord, Jesus Christ, the only Son of God, eternally begotten of the Father, God from God, Light from Light, true God from true God, begotten, not made, one in being with the Father. Through him all things were made. For us men and our salvation he came down from heaven: by the power of the Holy Spirit he was born of the Virgin Mary, and became man. For our sake he was crucified under Pontius Pilate; he suffered, died, and was buried. On the third day he rose again in fulfillment of the Scriptures; he ascended into heaven and is seated at the right hand of the Father. He will come again in glory to judge the living and the dead, and his kingdom will have no end. We believe in the Holy Spirit, the Lord, the giver of life, who proceeds from the Father and the Son. With the Father and the Son he is worshipped and glorified. He has spoken through the Prophets. We believe in one holy catholic and apostolic Church. We acknowledge one baptism for the forgiveness of sins. We look for the resurrection of the dead, and the life of the world to come. Amen. Come Holy Spirit, fill the hearts of your faithful and enkindle in them the fire of your divine love. Send forth your Spirit and they shall be created. Response: And you shall renew the face of the earth. Let us pray. O God, who by the light of the Holy Spirit, did instruct the hearts of your faithful, grant that by that same Holy Spirit, we may be truly wise, and ever rejoice in your consolation. Through Christ, our Lord. Amen. O my God, 1 am heartily sorry for having offended You, and I detest all my sins, because of Your just punishments, but most of all because they have offended You, my God, who are all good and deserving of all my love. I firmly resolve, with the help of your grace, top sin no more and to avoid the near occasion of sin. Blessed be Jesus in the Most Holy Sacrament of the Blessed be the Holy Spirit, the Paraclete. Blessed be the name of Mary, Virgin, and Mother. Blessed be St. Joseph, her most chaste_spouse. "They have pierced my hands and my feet; I can count all my bones" Ps 22.17-18. 2. Jesus bears his cross.